Joye is the best e-cigarette brand I have used, in my six years of consistent vaping. I have explored Njoy and Blu, but they are substandard as my experience has borne out. 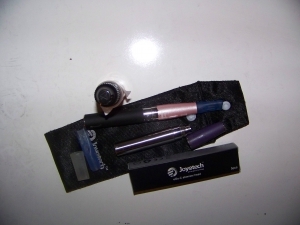 This kit I purchased is the Joye Electronic Cigarette ego-C Type A. I purchased this kit in 2013 and I was delighted. Prior to then I was using the ego-T which is also made by Joye. The ego-T is very similar; however it utilizes the “drip” function. My ego-C comes with a “tank” which is a small channel that holds the e-liquid for my vaping mechanism. in PG (Propylene Glycol) or VG (Vegetable Glycerin) I learned not to make the mistake of purchasing e-cig liquid that convenience stores carry as the storeowners are not able to vouch for the quality. I easily order the e-liquid online from a reputable distributor of the Joye line. I stopped buying the cheap e-liquid when I found a store in my area that specialized in Joye products and reasonably priced. Poor quality e-liquid may cause more gunk to build up in your e-cig’s atomizer and battery channels. e-liquid and reaches the atomizer through a little puncture on the inside. I also have a carrying case and charger which is used to charge the battery part periodically. It has a USB function and doubles as a wall unit with a standard plug outlet. The tank apparatus is enjoyable as the “drip” method can be tedious. Changing or cleaning the atomizer head seems to be my Achilles’ heel because when these get e-liquid accumulation great enough, it causes the device to stop dead in its tracks, until I change heads and/or clean them. I have bought the atomizer heads in packs of 5 which cost about $15.00. I wish that those atomizer heads would last longer. in the form of overheating (a scary thought,no?) when the coil on the inside pops. If it was not for that little caveat, I feel that I would give the ego-C a full ten stars. The atomizer heads can be a total pain. It feels like there is hardly any “draw” or flavor at some point and it is hard to tell if I need to change the little bugger, or clean it. I use a microfiber cloth to clean the individual parts and a q-tip to get in the small areas, but that “dry burn” is tricky enough to make me want to go back to the earlier ego-T model I was using before. Thank you.